A scientific research published not while ago conducted by the APA (American Psychological Association), many people have improved stress levels in the last few years. However, there are certain categories of people who are dealing with more stress compared to others. This may sound logical to you, but are aware of the fact that younger generations (born in the 1980s and 1990s), parents and people with lower income are the categories that are exposed to more stress? As we all know, there are many different sources of stress. Regardless of the source, the constant worrying about certain things can lead to serious health problems such as adrenal fatigue. The adrenal glands represent organs located right on top of the kidneys. These organs are here to produce different types of hormones and obviously the most important hormone they produce is adrenalin/epinephrine. Whenever our body deals with stress (be it emotional or physical), the adrenals glands release adrenalin which leads to increased heart rate and increased blood sugar levels and blood pressure. In this way the body gets energy boost to cope with the stressful situation. But, just like all other bodily organs, the adrenals have certain capacity and they can experience fatigue and even damage. If stress is present all the time, the condition known as adrenal fatigue appears and the risk of damage and tiredness is very high. Several scientific studies have shown that caffeine acts as a stimulant when it comes to adrenal glands and as a result of this interaction people experience increased levels of adrenalin in their bloodstream. But, it turns out that caffeine also boosts oxidative stress and this stress can cause damage to the tender tissue of these glands. A diet packed with high sugar levels has been linked to fat buildup in the adrenals. This situation eventually leads to specific metabolic syndromes and disorders like adrenal insufficiency, diabetes and certain issues with hormone release and management. The same goes for high fat diets. Next time you are in a grocery store, try to avoid canola, soybean and corn oil. Researchers have confirmed that these foods are highly processed and hydrogenated. They lead to systemic inflammations all over the body and this is something that has negative effects on the adrenal glands. Cruciferous veggies like Brussels, sprouts and broccoli are loaded with a compound known as diindolylmethane or simply DIM. A few studies have shown that this compound has the ability to eliminate adrenal cancer. Extra virgin coconut oil is another great addition to your diet because it combats inflammation and oxidative stress. In addition, it can be used to regulate weight of the adrenal glands. If the weight is higher than normal then the risk of stress and fat accumulation is higher. There is no doubt that high amounts of fat are not good for the adrenal glands, so replacing fats from junk and fast food with healthy natural fats from nuts and avocado is a smart move too. It was confirmed that the fat found in these foods can be processed smoothly and easily in the body and the body won’t accumulate any of the fat in the organs or blood vessels. Eleuthero root, holy basil and rhodiola are herbs that have proven to be useful for the health of adrenals. They can regulate stress, fatigue and issues associated with sleep, memory and workout resistance. They can also protect us from adrenal damage and cases of insufficiency. Another herb that can help us improve the work of adrenal glands is ashwagandha. This herb originates from India where it was used for hundreds of years as part of the Ayurvedic medicine (ancient medical practice in India). It has the ability to stabilize the production and release of hormones by the adrenals. A scientific study has confirmed that this herb can also regulate stress levels and reduce the chances of developing adrenal fatigue. Finally, fish oil is another good example of efficient supplement for stress management. This oil makes the body avoid boosting energy levels through adrenal glands when stress occurs and makes it rely on other mechanisms. It turns out that the last point is the most efficient and important one. Of course, we are talking about stress management. Taking care of adrenal health with the help of supplements and proper diet is effective, but using certain stress management methods can be even more efficient. 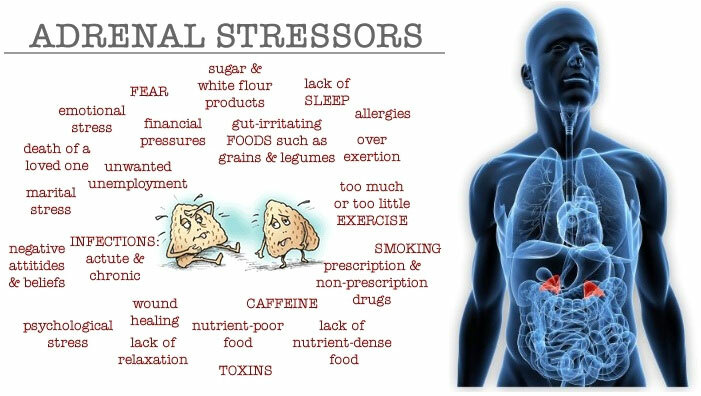 The following is a short list of tips that will help you avoid and eliminate stress and keep your adrenal glands healthy and fully functioning. Using massage can help you get rid of stress naturally. Exercises designed for deep breathing that last for 10-15 minutes can lower stress by promoting periods of the day filled with silence and calmness. Many people use these exercises as a warm-up for serious meditation which is also another good way to eliminate stress. The best part of these exercises is that they can be performed literally everywhere. Developing a sleeping routine will help your body re-energize and rest properly for the next day. In this way you will avoid the usual stress that occurs at work and improve the immune system. Physical activity on a regular basis will make stress go away and at the same time your body will release more endorphins which ultimately means improved mood.